Kenya: Why Does 'Nation' Refer to Ruto as 'Dr' but Odinga as 'Mr'? 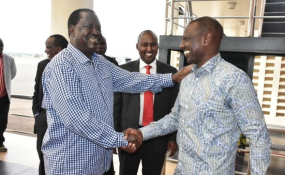 Orange Democratic Movement leader Raila Odinga (left) and Deputy President William Ruto (right). Some of the complaints I've had to deal with are from readers who complain that the Nation has allowed some well-known personalities to use the title of doctor (Dr) or professor (Prof) when, according to them, they don't have such qualifications. As a rule of thumb, however, newspapers accept in good faith what people say they are unless there is a clear case of misrepresentation. The latest complaint is slightly different. George Marenya complains that the Nation is intent on calling the deputy president "Dr Ruto". This is what he says: "I have noticed that, of late, Nation makes extremely conscious efforts to refer to the deputy president as 'Dr Ruto'. A doctoral degree (PhD), in our understanding, confers certain academic and scholarly expectations and responsibilities on the holder or recipient. The proper utility is within academics. "Talk of knowing people. So when the paper gets obsessed with 'Dr Ruto', it gets me wondering whether to blame it on ignorance, obeisance, oversight or what else." Mr Marenya's complaint is justified in only one sense: A number of leading media organisations do not confer the title "Dr" to politicians or persons whose work is not closely related to the degree. The New York Times does not use the title on people who do not work as physicians or dentists or in a closely related field, or whose doctorate is honorary. However, anyone with an earned doctorate may request the newspaper to use the title if the degree is germane to his or her primary current occupation. The AP Style Book, the bible for journalists, uses the title for individuals who hold a medical degree. If appropriate in the context, "Dr" may also be used for individuals who hold other types of doctoral degrees. However, because the public frequently identifies "Dr" only with physicians, according to the stylebook, care should be taken to ensure that the individual's specialty is stated. The Guardian Style Guide recommends the use of "Dr" for persons practising as doctors in the field in which they gained the qualification, including medical and academic doctors and doctors of divinity, but not for politicians. The impression I get from the complaint by Mr Marenya is that he thinks the Nation is being partisan by calling the deputy president "Dr Ruto" -- maybe because of the assumption that the title gives him a higher profile and conveys esteem and respect vis-à-vis other people mentioned in the same context. I suspect he has probably been reading too many statements like this: "Earlier that week, Kapseret MP Oscar Sudi, an ally of Dr Ruto, claimed Mr Kenyatta and Mr Odinga were pretending to be 'clean' in the fight against corruption ("Uhuru's dilemma as he juggles handshake, 2022 poll politics", by Oscar Obonyo -- Sunday Nation, March 17, 2019). It's as if Mr Marenya is saying: Why does the Nation say "Dr Ruto" but "Mr Odinga"? The deputy president graduated with a PhD in plant ecology from the University of Nairobi on December 21, 2018, a week after Raila Odinga was awarded an honorary doctoral degree by Jaramogi Oginga Odinga University of Science and Technology. Mr Odinga also has another honorary degree that he received in 2008 from the University of Nairobi. The Nation Style Book does not provide guidance on whom among higher degree holders to confer the title "Dr". But in general, the Nation does not use the title for holders of honorary doctorates. Unfortunately, the media in Kenya has not been consistent in the use of the title "Dr", although the general rule seems to be that the title is only conferred to those who have a medical degree or a PhD. Some individuals whose doctorate is honorary are still referred to as "Dr". The best known is "Dr Ouko". John Robert Ouko, the former Foreign Affairs minister who was murdered on February 13, 1990, was always -- and still is -- referred to as Dr Ouko. Dr Ouko had a degree in public administration, economics and political science from the Haile Selassie University in Addis Ababa, a diploma in international relations and diplomacy from Makerere University and an honorary doctorate from the Pacific Lutheran University in the United States. He was killed before he could finish his doctoral thesis with the University of Nairobi. The law in Kenya protects the use of the title "Dr". The Medical Practitioners and Dentists Act states that no person shall use the title "doctor" unless he or she is registered or licensed as a medical or dental practitioner. And the Act says those who have PhDs in other areas -- like the deputy president -- can use the title.